When Cherry Tucker’s invited to paint the “kill portrait” for the winner of Big Rack Lodge’s Hogzilla hunt, it seems like a paid vacation. Back home in Halo, a Hatfield-McCoy-style standoff builds between Luke and Cherry’s families. She’s ready for a weekend away, hobnobbing with rich and famous hunters, where she can forget her troubles and nobody knows her name. As Georgia sunshine turns to bleak December rain, Cherry’s R&R goes MIA when she finds a body in the woods. While the police believe the local drunk took an accidental spill, Cherry has her doubts, particularly when a series of malicious pranks are targeted at the rifle toting contestants. With loyal companions at her side—sort-of-ex-husband Todd and a championship bayer named Buckshot—Cherry tracks suspects through a forest full of pitfalls and perils. And all the while, a killer’s stalking the hunt party with a bead on Cherry. Related subjects include: cozy mysteries, women sleuths, murder mystery series, whodunit mysteries (whodunnit), humorous murder mysteries, book club recommendations, amateur sleuth books, Southern humor. 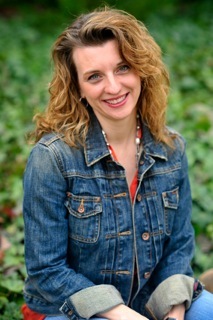 After teaching in the US and Japan, Larissa enjoys writing, particularly sassy female characters with a penchant for trouble. She lives near Atlanta with her family and Cairn Terrier, Biscuit. Visit her website or find her chatting on Facebook. 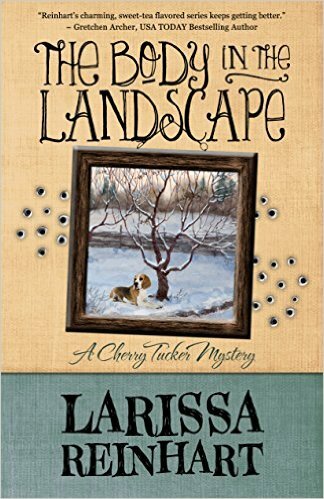 THE BODY IN THE LANDSCAPE is the fifth book in the bestselling Cherry Tucker Mystery series. The first, Portrait of a Dead Guy, is a Daphne du Maurier finalist, Emily finalist, and Dixie Kane Memorial winner. Thanks so much for having me on Michele! You are most welcome! Congratulations on your success!